In the nineteen seventies hi-fi boom, when every lifestyle magazine was telling people to buy large, unwieldy stereo separates, every self-respecting mass manufacturer offered the same thing in a single package. It was called a music centre, and admittedly the breed was ridiculed slightly, because there were some pretty crude packages on sale going by the same name. But the major hi-fi manufacturers took the genre quite seriously, especially Sony which was on a mission at that time to beat every other manufacturer in every possible way! 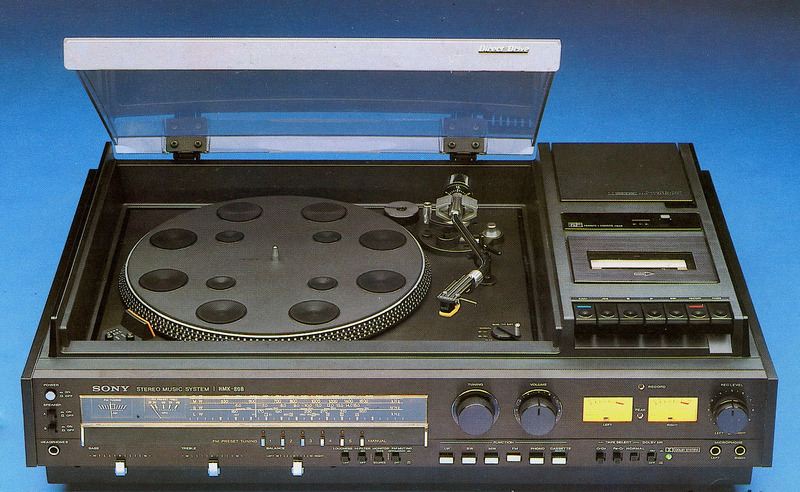 The HMK-80 was top of the company’s range of music centres, costing a massive £445 in 1978. To give you some perspective, that was twice as much as a Linn LP12 turntable, and half the price of a brand new base-model British Leyland Mini 850. Not inexpensive, then. Oh, and by way of recompense, Sony threw the kitchen sink at it. Better still, this didn’t mean it was a cheap design gilded by spurious features and fripperies – rather, the company engineered it very well and built it (in Japan) beautifully. What sets the HMK-80 apart from almost every other music centre ever made, and certainly all other lesser Sonys, is that has a direct drive turntable. Powered by a huge brushless, slotless motor of Sony’s own design, it offers adjustable speed by way of fine speed controls and an illuminated stroboscope. Seeing this light up, and the chunky strobe marks cut into the aluminium platter, was visual confirmation of the fact that the Sony was music centre royalty. It gave highly stable speed thanks to servo control hooked up to a magnetic pickup just behind the rim of the platter. The main chassis of the deck is pressed steel, to which a very period S-shaped tonearm is fitted, complete with removable magnesium headshell and Sony VL-34G moving magnet cartridge – which was a step up from the basic Shures of the day but nothing fancy. Another luxury the HMK-80 had was Short Wave radio, in addition to the usual FM, MW and LW bands. SW wasn’t of immense practical benefit in Western Europe in the late seventies, unlike you wanted to listen to tractor production figure reports from Radio Moscow. Actually, it was more about bragging rights than anything else. Still, the built-in tuner worked very well and came complete with a signal strength meter; it was very sensitive and its high status in life was underlined by five FM presets, the stuff of exotica at the time, although normal now. The matching cassette deck, which would doubtless have spent a lot of its time recording from the radio, is a good quality unit with belt drive, a decent (but slightly soft) permalloy head and a feedback controlled DC servo motor of Sony’s own design. It sported manual variable recording levels (as opposed to automatic) which wasn’t ubiquitous at the time, and a pair of VU meters which were tiny by hi-fi standards but better than most other music centres. One wild luxury was a peak level LED – rarely seen on most cassette decks, let alone music centres – and it had Sony’s beloved FerriChrome compatibility in addition to Cro2 and normal tape biasing and EQ. Using the standard Dolby B noise reduction with Sony FeCr tape and the levels properly set, it was capable of excellent recordings for a music centre, although Nakamichis still didn’t need to worry. The amplifier section was also of unusually high quality for a music centre, built around a specially selected low noise bi-polar op-amp and putting out 2x35W RMS per channel. This was amazingly powerful for a music centre back in the day, most of which mustered 20W at best. It runs from split rails and is therefore DC coupled throughout, again showing it was a serious, modern hi-fi design. It included a good quality MM phono input for the built-in turntable and an additional tape monitor loop, so a three-head cassette or open reel tape deck could be used. Sonically the HMK-80 is excellent – for a music centre. It’s not about to displace your modern high end separates system in your main listening room, but back in the day it was impressive, giving a powerful, clean and stable sound. Tonally it’s a little lean, as was the tradition from Japanese products at the time, but is never boring to listen to and you’re not aware that it is particularly compromised in any way. It’s a great little curio then – or I should say big, because it is huge for a music centre and incredibly heavy at over 20kg. A nice reminder of how we used to live, it still makes sense as a second system providing you plug a DAC into it, rather than a second tape recorder! I just found a HMK-77B on an eBay-like website and am about to run out and get it. My question is: do you know the difference between the 77B and the 80B? They look identical, so unless it’s a Japanese vs. European market thing, it must be something technical inside…? Great site btw – very good reads! Hi Bram – as far as I know they’re identical. Sony had a funny habit of labelling the same thing differently, according to different markets. Thanks for your comments about zStereo! I have an HMK-77B with is very similar to this one, but has no radio station memory. Could you tell me which other Sony turntables are compatible with this one if I’m looking for spare parts? Thanks! Could you tell me that the HMK-77B what other (Sony?) turntable compatible to get spare parts? Thanks! What spare parts are you after? It’s an odd question because you don’t buy a turntable to get spare parts for a music centre! My problem that the tone arm lift is wobbling so certain times it is unable to put and remove the stylus in time – that’s what I’m looking for – or how to fix it (literally). by looking for informations about this item I “landed” on your site. I am trying to find out how to memorize a radio station. Is there a way to do it? I tried to press both the buttons for manual tuning and the preset button I want to program, but that did not work. I have a HMK80 System on my bench now and what can I say? It looks chaotic inside, pour quality components but DC coupled Amp. A nightmare to repair because everything around the amp and power supply is fixed wired without connectors. I’m still wondering where the 20Kg comes from. But for a music system it looks like a decent kit and the turntable is absolutely fine in this price range. This may a repair project for long winter evenings. Having repaired its smaller cousin the HMK55 the only thing I can say is go for it. Yes the fixed wiring is a pain, and it pays to put plastic covers over the exposed live wiring before you start. Equally however all the boards are easy to get to and very repairable. The tuner especially is great. On mine one of the amp chips was shorted, so I replaced them both with modern ones. This unit makes a great second stereo, and I really love it. I remember a HMK-77 arriving at our family home in 1977. Sony introduced this as a successor to the HMK-70 during that Autumn and it came packaged with West German made SS-2030 speakers, later replaced with KEF Concorde IIIs, which matched the system really well, producing a vast sound in our lounge. Sony pulled out all the stops with this “music centre” making it a viable alternative to separates for a while. The ’80 arrived a couple of years later adding some refinements like those tuner presets but little else was changed.